Tabby Tweny Nines YouTube wood-engraved animation. National Library of Wales four linocut pound coin designs.The Royal Mint Two Pound Coins 2013: description of the London Underground anniversary coins. The Royal Mint Pound Coins: overview of pound coin designs including the Bridge series. Museum on the Mound Edinburgh displays the linocut for the Forth bridge Scottish one pound coin design seen on Coins page. Paper Press Print: folio of 45 prints by artists associated with the Print Department at the School of Art Aberystwyth. 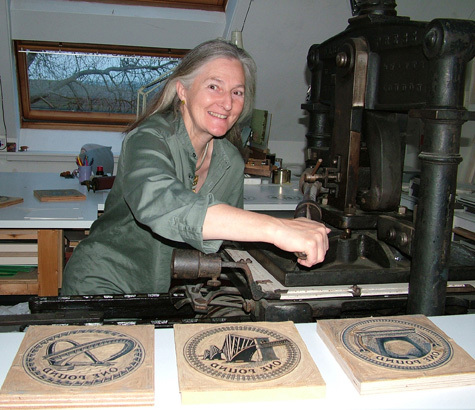 Intaglio Printmaker London: traditional wood engraving tools configured by Edwina Ellis. London Transport Museum artwork for London Transport Poster. Museum of London 9 colour wood engravings from the TFL poster. Ashmolean Museum over 40 Edwina Ellis prints are in the collection. Victoria and Albert Museum suite of 5 engravings & a set of jam labels. Fitzwilliam Museum Cambridge five black and white engravings. Art Gallery of NSW One black and white engraving. Society of Wood Engravers member since 1984.